How does Experimental Group get everything just...right? In June 2007, a little cocktail bar opened on Rue Saint-Sauveur. Behind an unassuming door and heavy velvet curtain hid Experimental Cocktail Club - a bar with good drinks, service and a speakeasy vibe that, at the time, was unknown to Paris. Ten years on, ECC Paris is seen as a blueprint for what makes a great cocktail bar. 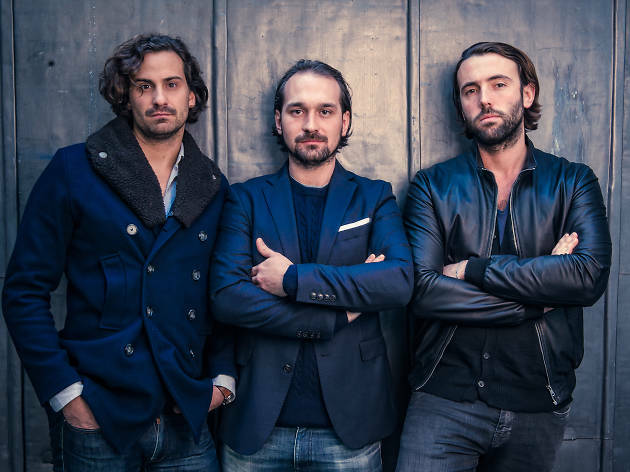 Since then, the three childhood friends - Olivier Bon, Pierre-Charles Cros and Romée de Goriainoff - launched Experimental Events as a brand, and gone from strength to strength. Migrating from cocktails to wine and steakhouses, and more recently into hotels, the Group have their sights set on all corners of the globe. We sat down with Olivier Bon at the Group's newest Paris restaurant, Balagan, to talk about the Experimental formula, design details, and what’s on the horizon. Experimental Cocktail Club Paris celebrates its 10th birthday this month. What does this decade mean for you and how have you seen the company grow? For us it’s really important because it marks the next step. We see ourselves moving into the hotel industry and becoming a lifestyle brand. We want the Experimental Group in be every part of the hospitality industry, and also to do something new for us, as a company. You once said that you changed nothing at your first bar - ECC Paris - because it works so well. Is there a special formula that you apply to all your projects? We started our cocktail bar wanting three key things: love and passion, the best drinks and design, and good service. We apply these rules for everything we’ve done since. This backbone worked so well in ECC - people still love it 10 years on - and it works in all of our locations. How influential are other cultures/cities for you? The Beef Club was also influenced from our American travels - NY, Miami, Canada - where we discovered the concept of a real steakhouse; with great meat, lots of sides. We took some ideas and gave it a French touch. People say that ECC London has a very French feel. This wasn’t intentional but it’s probably something to do with the service, the cocktail recipes… I’m not really sure! Paris, London, New York, Ibiza – all have distinctly different vibes. How does Experimental adapt to all these locations? It completely depends on our timing. When we opened ECC in New York, the crowd was wanting a speakeasy atmosphere, but with Compagnie des Vins Surnaturel it was completely different. We took a year or so to get somewhere. Our instinct was to do a list of 600 or so wines, but we soon realised that Americans don’t want to be lectured by a French guy on which wine to drink - they want to choose themselves. So we changed tact, worked with an American sommelier and got there in the end! London is more familiar for us but we still adapted certain things, like having recipes that were a bit sweeter and make things more customer friendly. Londoners like to book so we have a manager and runners - it’s a lot more professional. What factors are there when you look for a new location? It’s a question of opportunity, and usually now, people come to use with ideas. We’re currently working on two projects: one in Verbier, Switzerland; and in Venice, Italy. I go and check out the place and then we take steps to decide whether it could work. In London for example, it’s really hard when the competition is so tough - we don’t have £1 million to spend on places! Henrietta Hotel is an amazing space that got through a good contact from our Compagnie de Vins project at Neal’s Yard. It's like a spider, contacts come from everywhere! In this age of Airbnb and low-cost accommodation, why do you think people should still go to hotels? I think Airbnb is actually a good thing for the hotel business! Paris has been one of the most affected by the arrival of Airbnb but this has made hotel owners face up to reality. When you have hotels with bad service and cheap breakfasts, of course Airbnb is the better option! For the last 2-3 years, hoteliers have woken up and started to do something better. Our hotels haven’t been impacted by low-cost options because our customers are looking for something different. It’s a question of service. When you can stay somewhere where the service is great, everyone’s happy, where the bar is good but not expensive, the food is modern and fresh, then why would you want to go to an empty flat? It’s a completely different experience, it’s not a competitor at all. Despite what most people think, there’s actually a lot of opportunity to create lifestyle brands out of hotels. At Balagan we’re linked to the Renaissance Paris Vendome hotel which is very old school, and they woke up to the fact that people don’t want a chain hotel anymore. So they asked us to do something very different for their restaurant. We thought outside the box for the menu, did things that people haven’t necessarily used to (in France or America) and thought more about trendier people. They wanted to take the risk and they know that it’s going to be a game-changer for the hotel. Do you think the future is in these hybrid locations? Somewhere you can come to even if you’re not staying at the hotel. I can’t predict the future, but it definitely seems to be a trend. A hotel can be a place that you go to have a drink, or to work now. This is definitely a movement in Paris and what we, as a business, want to focus on now. Which places in Paris inspire you? I like traditional restaurants, like L’Ami Jean, which is a really old and noisy. Derrière and Le 404 were really groundbreaking at the time. They made these ideas work in neighbourhoods that no one really lived in. IT was something completely new. There was a first wave of cocktail bars that were very similar to ECC, speakeasy style, but now there are new places, like Gravity Bar, Le Syndicat. The recipes are for a younger crowd, they’re trying some really innovative things. Tell us a bit about your next project, Grand Boulevard Hotel? This is our biggest project to date with 50 rooms, it’s huge! The building dates from 1790 and it’s in the heart of Paris, upper Sentier. The area is really changing; there’s lots of tech companies, restaurants, and beyond that you have Grand Boulevards which is big and noisy. There’s a little corridor connecting the two, and this is where we are. It’s classic Experimental - a bit hidden, very relaxed. We can really play with the 300m2 space - a garden, rooftop yoga classes, canopy in the winter, plants everywhere! For the restaurant, Giovanni, our chef at the Grand Pigalle, is creating a rustic menu of meat to share, veggies, oven bread, soups. Soulfood. The design is by Dorothée Meilichzon who does all our decoration. She’s going to do a mix between the 18th century style of the building with more bohemian elements. Basically, we want a luxurious look but executed in a modest way. This is the tagline of our brand - affordable luxury.